For those who work in Toronto’s downtown core, finding affordable housing close to the office can be a challenge; the average price of a house within the 416 hit $1,320,333 in 2018, and while the average condo unit is still comparably more affordable at $593,366, that’s still financially out of reach for many who are employed in the region. That’s fueled an exodus from the city proper into surrounding 905 communities, where homebuyers’ funds go a lot further - however, improved affordability and larger lot sizes often come at the expense of the daily commute. Those expanding their home search further into the Greater Golden Horseshoe – including Mississauga, Hamilton, Burlington and Oakville – will need to factor a lengthy trip on the highway or public transit into their expenses and schedule. 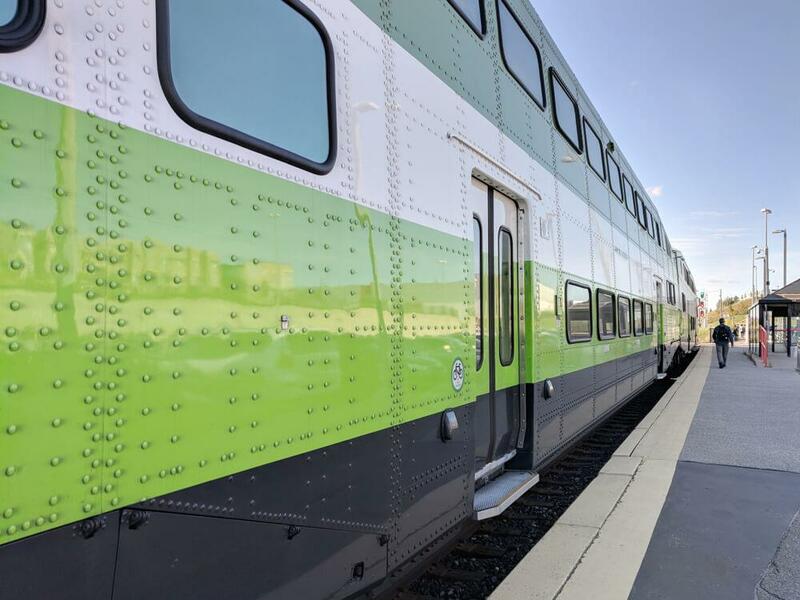 This increased interest in the 905 housing markets is evident in the growing usage of GO Transit, the provincially-owned regional transit network. It boasted a ridership of 56.6 million people in 2018, upping service by 13% to 217 weekly trips to cover the growing demand, with plans to increase rides further by 55% over the next two years. But where along the GO Transit train network will homebuyers find the greatest value and the easiest commute? To find out, Zoocasa sourced average home prices based on sold listings within a two-kilometre radius of each of the 66 GO Train stations, and then cross referenced them with daily weekday morning commute times to Union Station, estimating an 8:30 am arrival. Generally, the numbers reveal that the cheaper the housing, the longer the ride; stops in Hamilton and Kitchener rank as the most affordable along the transit network. The least expensive market can be found within proximity to West Harbour station, where homes go for an average of $365,927. However, riders better be prepared to endure a 71-minute one-way commute in exchange for those relatively low housing costs. 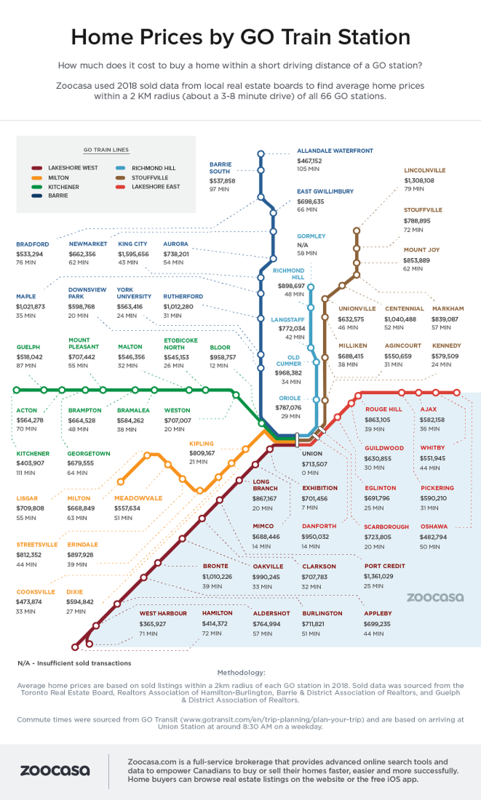 Kitchener station ranked second with an average home price of $403,907, and a whopping commute time of 111 minutes. Hamilton station rounds out the top three with an average home price of $414,372 and a 72-minute commute time. The priciest neighbourhoods by GO Train stations were found just north and to the west of the 416; King City, located just below Aurora and Newmarket, ranked as the most expensive, with the average home fetching $1,595,656. However, commuters can reach the core in under an hour, with the average ride taking 43 minutes. It’s even quicker for those coming in from Port Credit at 25 minutes, though buyers can expect to pay an average of $1,361,029 for a nearby home. Lincolnville, located in Whitchurch-Stouffville, comes in at third most expensive with an average home price of $1,308,108, and a commute time of 79 minutes. Penelope Graham is the Managing Editor of Zoocasa.com, a real estate website that combines online search tools and a full-service brokerage to let Canadians purchase or sell their homes faster, easier and more successfully across the nation, including Toronto, Mississauga, and Burlington Homes for sale. Home buyers and sellers can browse listings on the site, or with Zoocasa’s free iOs app.